One of the reasons the time spent reading the paper has declined may be due to the fact that today's newspapers have much less content than they had five years ago. freep and the Detnews now dont get eather. So ... we're saying newspapers have list 11 million in Sunday circulation, or 18 percent since the peak. Can someone find some context with other traditional media? How much has network viewership dropped from, say, 1985, on say, a Thursday night? How much has viewership dropped at network newscasts? In addition, how many MORE readers are newspapers getting now on their websites. It may be more than an acorn falling on our heads, but the sky ain't falling. We do not help the situation by panicking. We should be damn proud of our product and ought to be telling the story of how we've retained a large majority of our most loyal customers despite tremendous technological disruptions. 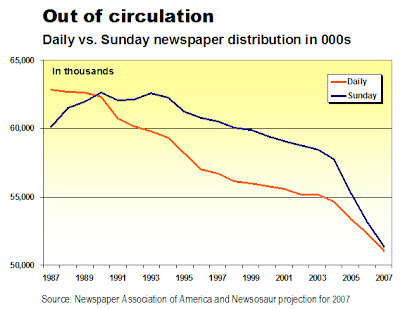 So ... we're saying newspapers have lost 11 million in Sunday circulation, or 18 percent since the peak. The New York Daily News is notorious for laying off smart, hard-working, dedicated management and replaces them with younger, know-nothing-about-the-newspaper business types who do nothing all day, they don't even answer their phones! Money is not being spent where it should be, and the "quick-fix" attitude is killing the Daily News. It used to be a company where loyal employees were treated with respect, not shown the door just because the owner doesn't want to take a real, hard look at the product and at the smart people. It's a political thing--with the old-boy network at work. Out with the good guys--in with the asleep at the wheel team who should not be in charge of marketing, circulation or anything at the newspaper! Remember one thing re Sunday Circulation and the insert business, many papers have built a non-subscriber delivery system that has increased revenue for this business. Same goes for Daily. This is the wake up call that publishers needed to stop the knee-jerk rate hiking that they force on retailers year after year for several generations. The new generation is smarter and not going to put up with it anymore. As a former print buyer for a major national retailer, I can safely say that print will never go away because a sizeble demographic group still rely on the newspaper to get current events, but more so for local news in their community. Newspapers need to scale down their projections and expectations going forward. It's already been established as a reality that circulation has declined (and will continue to decline) into the double digits zone for the last three years. Don't cry and blame technology, work with it and adjust/manage your expectations accordingly. I always tell my kids this when they cry about how unfair something is: "Learn to adapt to the world; don't expect the world to adapt to you." Most newspapers have shown no significant regard for the things I value most in the world - my family, my children, my church, my nation, my security - over the past several years. So it doesn't surprise mr that I feel no significant regard for theirs, now. Newspapers will continue rolling down the slippery slope into the dustbin of history. Most newspapers will not change their bias because most newspapers are vanity publications! They are just toys for billionaire publishers to play with, to manipulate the public. Go see Citizen Kane. When Kane boasts he doesn't mind losing millions of dollars a year even if he goes out of business in . . . sixty years, think of Pinch Schulzberg.